This event, which will take place in the college Chapel, will involve the whole of Dante’s Inferno, in Robin Kirkpatrick’s translation, being read over the course of six hours by over 30 volunteers, interspersed with appropriate musical interruptions. The first in a series of events exploring Underground Medieval London: drop-in to the atmospheric crypt of St Etheldreda’s Church in Ely Place to see a site-specific performance from the Irish artist Ceara Conway. 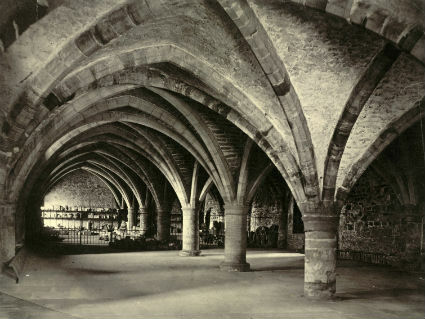 Working with a group of PhD students from King’s College London, Ceara has created a performance piece for the thirteenth century crypt underneath St Etheldreda’s Church inspired by the location and the story of St Etheldreda. Take a journey through underground medieval London on a walking tour through the hidden medieval sights of central London with PhD students from King’s College London as your guides.The tour starts at the beautiful thirteenth century crypt of St Etheldreda’s, where you will hear about the severed hand of St Etheldreda, still kept in this church at the heart of the city of London. You will visit medieval inns, dubious medieval pubs, hidden crypts, and hear the story of the Knights Templar! The Underground Medieval London series will conclude with a panel discussion on creative engagements with the medieval with Ceara Conway, Dr Josh Davies, Kathryn Maude and Jessica Barker.This an opportunity to hear Irish artist and singer Ceara Conway reflect upon her engagement with the medieval past in her work, she will also answer any questions about her specially commissioned performance for St Etheldreda’s crypt. Ceara will speak alongside academics who will discuss their creative responses to their own medieval research on the city, saint’s cults and devotional culture. For the full programme of the festival and to book tickets, please visit the festival website. This entry was posted in Uncategorized, Upcoming Events and tagged Dante's Inferno, events, KCL Arts & Humanities Festival 2014, panel discussion, performance art, St Etheldreda, Underground Medieval London on September 27, 2014 by michaelazoeschg.